How and why the UN has been sidelined in Palestine. 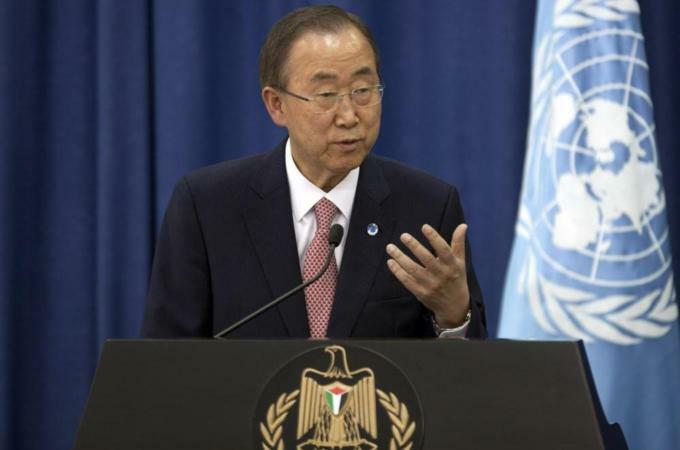 When Ban Ki-moon called for an “end to the violence” in Gaza last month, his call fell on deaf ears. When he urged an “end to the madness”, Israel yawned. It wasn’t until the UN Security Council issued a mild presidential statement urging an “immediate humanitarian ceasefire” that the Israeli government snapped. Even though the statement fell short of Palestinian and Arab demands, Israeli Prime Minister Benjamin Netanyahu called UN chief Ban Ki-moon to protest the statement’s partiality towards Hamas. He lectured him about the rights and wrongs of its wordings, even though the statement never mentioned Israel or Hamas by name, and, besides, Ban Ki-moon is not responsible for UN Security Council Statements. President Mahmoud Abbas made no such call to the secretary general, but a group of distinguished scholars and NGOs told him in an open letter that he should either stand for law and justice or resign. They recalled how in a series of statements, Ban Ki-moon neglected to name Israel as the perpetrator of violence, making no distinction between occupied and occupier. A former Korean foreign minister, who was elected twice to the UN post, he has shown the public different faces: the angry diplomat who demanded that the parties must “stop, stop, stop fighting” and that “this madness must stop”; or the pragmatic diplomat who follows the US State Department lead; or the weak toothless secretary general that presides over the un-United Nations. Like most of his predecessors, the secretary general can be effective only when the UN is united. Alas, the organisation, which has proved particularly indispensable in various parts of the world, is terribly dysfunctional when it comes to Palestine. Over the last few decades, Israel has disregarded hundreds of resolutions, “censuring”, “deploring”, “urging against”, “recommending against”, or “condemning” its attacks, settlements, deportations, occupation, etc. 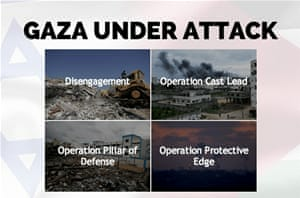 Moreover, the statement hardly scratches the surface let alone begins the process of ending the occupation of Gaza and Palestine, which acquired an observer status at the UN in 2012. No cause has consumed as much UN paper work as the plight of the displaced and occupied Palestinians. But after six decades, hundreds of its resolutions on Palestine are yet to be respected or implemented. Nowhere has the UN ideals been more mired in power politics than in Palestine. Cold War rivalries have also contributed to UN paralysis in the Palestinian-Israeli conflict, which explains why more than half of the 690 resolutions adopted by the General Assembly from 1947 to 1990 have been ignored. But what justifies sidelining the UN ever since? The US has championed efforts to neutralise UN intervention to end the occupation in Palestine; Washington has vetoed more than 40 UN Security Council resolutions critical of Israel’s policies some of which were drafted by its European allies. Such obstruction succeeded in lowering and even diminishing all expectations that the UN can play a major role in ending the occupation and resolving the conflict. Alas, the end result has served neither party, nor has it helped peace and security in the region. It’s instructive that most of the major post-Cold War conflicts have seen direct UN involvement including: Bosnia, Kosovo, Somalia, Kuwait, Iraq, Afghanistan, Syria/Lebanon, and as of late, South Sudan. But not the oldest among them, Palestine. Likewise, all pleas and demands for humanitarian and political interventions fell on deaf ears. The only time the UN was allowed to act was in 1997 when it sent few international unarmed observers to the occupied city of Hebron. Alas, they weren’t even mandated to speak publicly about the ongoing violations. Only after the terrible failure of Washington’s sponsored peace process, was the UN “allowed” to play a political role; it became a junior partner of the US in the International Quartet along with the EU and Russia. For the past four decades, Israel has violated all relevant UNSC council resolutions such as the resolution 465 of 1980 that strongly deplored all measures taken by Israel to change the physical character, demographic composition, institutional structure of status of the Palestinian and other Arab territories occupied since 1967, including Jerusalem. It has also rejected Resolution 476, which reaffirmed the necessity to end the Israeli occupation of Arab territories since the 1967 war. The only UN Security Council Resolution that was accepted by the US and Israel as the basis of the diplomatic process, i.e. 242 of 1967, was also systematically violated. Israel has been expanding its settlement activity when the resolution notes the “inadmissibility of the acquisition of territory by force”. But the so called “international community” which entered the diplomatic jargon about the same time that Israel became a reality and Palestine became a tragedy, has been neither “international” nor behaved as a “community” when it comes to Israel and Palestine. Worse, those who tend to speak for the “international community”, namely in the West, are the powers that obstructed the implementation of the UN resolution in Palestine. In that context, Israel was created by a UN recommendation, and was accepted as a member on the basis of its commitment to respect UN resolutions, and specifically UNGA 194 regarding the return of the Palestinian refugees. More than a million of those refugees continue to linger and suffer under Israeli siege of the Gaza strip. It takes a lot of nerve for the UN Security Council to address another Israeli war on the Palestinians of Gaza as if it were between two equal partners and without recalling the bitter fact that it has let down Palestinian refugees for decades. More importantly, its failure continues to lead to more suffering and instability in Palestine and beyond.